So I've had a chance to try Czerka Corporate Labs and Czerka Core Meltdown (the two new flashpoints) on both difficulties since my last post. 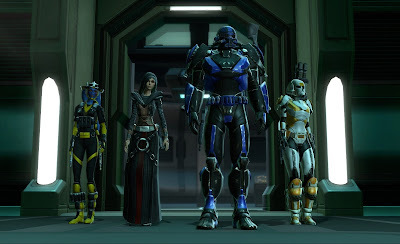 I have to admit - and I hate to say this because in general I really love what Bioware does with flashpoints - that I initially felt a teeny weeny bit disappointed by the experience. Why? Because both flashpoints are quite thin on story. In fact, I believe that they are the first flashpoints in the game that do not contain a single interactive cut scene. There are some voice-overs as you progress through the building, and a little non-interactive cut scene as you approach the last boss in each instance, but that's it. Previously even the more "dungeon crawl like" flashpoints at least contained a little bit of non-combat player interaction, even if it was just to make a simple light/dark side choice at a console. I can only hazard a guess as to why Bioware decided to go down this road, and I bet that endgame players who routinely chain-run instances for commendations will love this more streamlined experience with no "space-barring", but to me it feels like an essential part of what makes SWTOR's flashpoints unique has gone missing here. That makes me a bit sad. I liked the intro mission to the whole thing well enough, but then it was just a matter of going in, killing everything in the way and coming out again. That just felt a bit... lacking to me. There were good things about the experience too of course. The new model for story modes not requiring a proper trinity group seems to work well. On the longer/tougher boss fights there are "kolto stations" spread around the room which you can click on if your group doesn't have a healer for example. As a side effect the whole thing feels ridiculously easy if you actually do happen to have a tank and healer, but... it's story mode. It doesn't really matter. As for hardmode, there's the usual debate about whether it is correctly tuned. This forum thread says it's not; supposedly it's too hard. When one of my guild's tanks came out of the hardmodes for the first time, he immediately commented that he found them too easy - but he's also used to tanking nightmare operations. If flashpoints that are supposed to be on par with hardmode Hammer Station and Athiss were challenging to him (keep in mind that unlike Lost Island back in the day, this is not supposed to be a new "tier"), I'd actually be worried. Myself, I also went in with a guild group in full 72 gear and we had an easy time, unsurprisingly. I did notice however that there were parts, especially on some boss fights, where the incoming damage seemed quite considerable. I can see those being very hard on lesser geared groups. In regards to trash, I loved the mechanic with the red and blue mobs in Corporate Labs. Silly but fun, even if the red ones do pretty harsh amounts of AoE damage on hard. On the visual front, Core Meltdown in particular offers some gorgeous environments. I loved all the different habitats. And as one of my guildies commented, the sound effects are pretty atmospheric as well. I'll have to take some more screenshots there next time I get a chance (and assuming the game decides to cooperate with my print screen button, which it didn't tonight).